After five long code-heavy tutorials, we finally arrive at the most central of components to the Tower Defense (TD) genre: Towers! Towers are crucial in your TD game. Now, by “towers” I don’t necessarily mean some phallic, stone structure jutting into the sky that rains death upon enemies nearby. “Towers” here could be any unit, object, creature, etc that the player can place on the map, that can impede the enemies from reaching their destination. Some games may have actual tower structures, some games may have army guys with bazookas, some games may have a house or spawning structure you place nearby and the player’s units spawn from there to stop enemies. The tower is the primary mechanic that empowers players with a way to experience strategy, tactics, accomplishment, and fun (not an exhaustive list of nouns!). That said, unfortunately I really don’t do the tower justice in this demo. If you’ve played the demo, you’ve seen that my two Towers are simply a blue and a red box. The enemies are animated and much much prettier than the towers. Hell, even the bullets have some particles with them and are prettier than the towers. Anyways, here’s the point. I showed you last time how I created the Enemy animations. You could do the exact same thing for Towers and have yourself some pretty animated towers with different states “reloading”, “firing”, etc. Before we start, feel free to check out the finished product of my AS3 Starling TD Demo. **Update 8/1/13 – abstracted out Tower’s enemy-finding strategy to a ITowerStrategy.as and TowerStrategyNearest.as. Also added some commentary on design patterns. Ok, like the previous post on enemies, we’ll start with the JSON data of how we define towers. This is the first tower listed in the src/assets/json/towers/towerData.json file that defines two types of towers. Let’s look at it line-by-line. Line 7 – imageName is used by HUDManager to place an image representing the tower onto the UI so the player can click it. Unfortunately it also becomes the image of the actual tower used on the map. Ideally, like with the Enemy data, there would just be a texturePrefix somewhere that said, “this tower uses ‘towers/tower1_’ tiles”. Line 8 – the image to use for the bullet the tower fires. If you wanted your towers to fire different bullets based on their levels, maybe you could move this property down into the levelData? Line 9 – bulletSpeed is how fast the actual bullet travels on the map per tick. You obviously want this to be much faster than the Enemy moves, but slow enough that you actually get to see the bullet in flight. Line 14 – the maximum number of levels a tower can upgrade. So this tower starts at level 1 and can be upgrades to level 2, and finally level 3. So it can be upgraded 2 times essentially. Line 15 – this is an array of sound states like we saw with Enemy data. As we’ll see later, I’ve defined the Tower sound state “onFire” to play when the Tower fires a bullet. If you have the state: “onFire” defined here, it will play that sound. Line 21 – this is an array of the different params a tower has at different levels. Line 23 – what level is this data for? This Object has data for level 1. Line 26 – at this level, the tower has a reload delay of 1500ms, or 1.5 seconds. If you check out the file, you’ll see the other tower data listed there as well. Now we’re going to follow the data into the TowerManager and see what happens to it, then afterwards we’ll actually look at our Tower class and how that works. Line 53 – that is one sad, empty destroy() method. You can get the idea of what should be here from the enemies tutorial. It would be a loop through the _towers, calling destroy on each one, removing from the stage, and cleaning up Signals and such. Line 55 – this gives us a function where I can pass in a specific Tower instance and have that removed from TowerManager’s management. This happens when a user Sells a Tower. Line 64 – when the Tower is removed, dispatch onTowerRemoved Signal to let CollisionManager know that there is one less Tower to loop through. Line 67 – createNewTower() gets called when the user clicks on a Tower icon on the HUD. Line 68 – _currentTower is a reference to the Tower the player last clicked on, so since clicking on a Tower causes the range ring to show up, if there’s already a _currentTower, I want to call deactivate() on that tower so its range ring hides. Line 74-75 – pos is the x/y position that the player clicked to click the Tower icon on the HUD, so I want to set the new Tower’s x/y to pos x/y minus half the Tower’s width and height. This centers the Tower icon on the mouse point. Line 79 – now, normally I would add this tower to _canvas. I actually do that later as we’ll see. But for now I want to add this Tower instance directly to Play. If I called _canvas.addChild(tower) then the Tower would actually be behind the HUD. Adding the tower to Play allows the Tower to be on top of all that. Line 87 – I’m going to switch on touch.phase. Having to do a switch on Touch.phase would be like if you just got one single MouseEvent for MOUSE_DOWN, CLICK, MOUSE_UP, MOUSE_MOVE, and all the other MouseEvent events. Anything you do with the Mouse immediately throws the same MouseEvent and then you have to go through conditional logic to figure out which damn event was thrown, and what you want to do about it, instead of being able to listen to one specific state of the MouseEvent and just react on that. TouchEvents, if you can’t tell yet, are not my favorite thing. If you are NOT developing for a phone or table (which, yes, is why Starling is here), they are a bit of a pain to get used to and work around. I realize Starling is from Sparrow and its roots are in phone development. Anyways, moving on. Line 88 – TouchPhase.BEGAN happens when your mouse is down. There is no concept of “MOUSE_UP” in Starling, so we don’t know if the user has clicked and held down the mouse button, and they are dragging the Tower icon, or if they just clicked once to create the Tower and now they’ve let off the mouse button and they’re just moving the mouse. This only allows the player to click and let off, then move their mouse to place a Tower. You cannot drag the Tower icon around the stage. But oh well, minor use case ignored. I will probably want to spend more time trying to get this to work for both cases just in case people like playing one way or the other. Line 90 – if the Object that comes back has canPlace set to true, then we can place the Tower here. Line 105-106 – update the _currentTower’s x/y and a class _p Point object’s x/y to the touch location position minus half the width/height again to keep the Tower icon centered on the mouse. Line 109 – calling Map.checkCanPlaceTower() again and passing that Boolean “canPlace” property into the Tower.enterFrameTowerPlaceCheck(). As we’ll see later, that handles if the range ring is red and we cant place the Tower in this tile, or if the range ring is blue and we can place it here. // Add half the cost back to currentGold This can be modified later! Line 1 – gets called by Tower when the Tower checks to see if its next shot will kill the Enemy, if it will, it calls TowerManager.removeEnemyFromTowers() so the Enemy gets removed from other Tower objects so they don’t try to shoot too. Line 5 – loop through all _towers and call removeEnemyInRange() on all of them. Line 21 – this function actually places a Tower… cements it into place in a specific tile. Line 24-25 – Take the tileWidth/tileHeight of the tiles, subtract the width/height of just the tower image since the _currentTower.width is currently expanded due to the Tower’s range ring, get the halfWidth/halfHeight and multiply them by 2 (bitwise << 1). What's that spell? 42. No, so basically again I need an offset. I've got a Tower that is 20x20 px, a tile that is 24x24 px AND the 36px offset from the top-left corner of the map beginning at (36,36) not (0,0). So this calculates that all out and tells me the exact x/y coordinate to place the Tower icon so that it fits centered inside the tile. Wee. Line 27-28 – actually set the _currentTower’s x/y to the coordinates passed in with p:Point plus offsets. p:Point in this case is actually the correct x,y coordinates for the top-left corner of a tile so we can just add the offset and know we’re going to be all centered up. Line 31 – call Map.placedTower and pass in the Tower instance. This, as we’ve seen, lets Map update it’s map data so that another Tower cannot be placed onto this Tower. Line 40 – if a player has clicked on a Tower then clicked the Sell button, this function gets called. This should be better set up, but basically when you sell a Tower, I’m adding half of the Tower’s cost back to the player’s currentGold. This line right here could be pulled out into a whole new set of upgrades. “Salvage more when selling Towers” and each upgrade point saves you an extra 10% of the Tower’s cost when you sell or something. Line 41 – destroy the tower. Line 44 – _onMapClicked() gets called after a player has clicked on a Tower, activating it, and we added an event listener listening for any touches to the Map. Line 59 – this is a public function that lets us get at the private _towerData object specifically for cost. Line 63 – takes the towerData Object from the JSON file and parses it into the local _towerData Object that the class uses. Line 71-72 – TowerManager doesn’t need to do anything on pause/resume yet. Alright… so now we’re through the TowerManager.as. Let’s look at the actual Tower.as. Update 8/1/13 – updated Tower to actually use a proper abstracted TowerStrategy which we’ll talk about later. Line 173 – we have to call setInterval here because when you click to place the tower, then add touch event listeners, those touch event listeners somehow get triggered. I have to tell Flash to wait 100ms before really actually initializing the Tower and adding touch events to let those bubbling events clear out. No amount of stopImmediatePropagation or anything would help. Line 180 – hide the range ring. The Tower has been placed, the player can click the Tower again if they want the range ring. Line 183 – listen for Config’s onGameSpeedChange Signal so the Tower can update. This should probably be at the Manager level so the manager can update all of its Towers. Line 189-190 – get rid of the bad range ring since the Tower is already properly placed. Line 196 – called to set or change the Tower’s Strategy. So far this is all that needs to happen here, but you could also potentially have different visual states for your towers depending on where they’re aiming. So that could be handled here too. Line 33-39 – reset _animData, create a new MovieClip with the Tower texture, then change the animation state. Since there is only one state for the tower in the demo, that stays constant. Line 41 – gets called when a new Tower has been created but the player has not placed it yet. This happens every time the mouse moves until the player places the Tower. Line 33 – we saw this in the Enemy class. It just changes our animation state. Line 85 – activate() gets called when the player clicks on this Tower. Set activated to true, show the range ring, and add event listeners to the Map for when we should deactivate(). It also calls the HUDManager and tells it to display this Tower info. Line 113 – we saw from Enemy that this checks to see if we have a specific sound state, and if we do, play it. So there is how the Towers are made and managed. Now let’s turn our attention to a really fun topic, Design Patterns! Design Patterns are a tool. They are a way for you, as the developer, to use battle-tested patterns of how to structure your code so that you can get the most reusability, extensibility, and other -ity words that you’ll find in the definitions of “Object Oriented Programming”. Being that Design Patterns are a tool, if you ignore them, you’re none too bright and you may be wasting your time when perhaps the wheel has already been invented. Like a tool though, you don’t use a hammer when trying to cut down a tree. That’s what chainsaws or axes are for. The sign of a solid developer is knowing when to use appropriate design patterns, and almost more importantly, when Not to use design patterns. 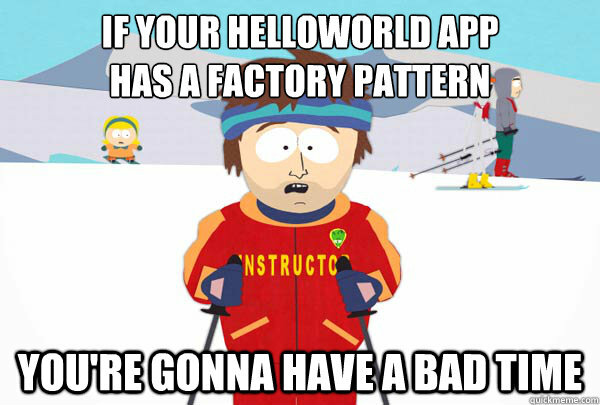 Be well-versed in Design Patterns and know when and when not to use them. The intent of the Strategy Pattern is to be able to define a family of algorithms, encapsulate each one, and make them interchangeable. Strategy lets the algorithm vary independently from clients (Towers) that use it. ITowerStrategy.as is found at com.zf.objects.tower.strategies and defines the Interface that all tower strategies should have. Line 7 – we’re simply creating a new interface here with one function. Every ITowerStrategy implementation will have a findEnemy function that takes a single enemies array as a param. So let’s step back from the code and look at this from a project perspective. Why is this useful or helpful at all? Well, 1) as previously stated, this cleans up our Tower.update() function considerably. There’s no longer a massive, nasty if/else if/else if (or switch) so there’s no way for the logic to get confusing. Each Strategy’s specific algorithm for finding a target enemy is encapsulated within it’s own class. And 2) Unit Tests. You can easily Unit Test this class’ findEnemy() function infinitely easier than if you were trying to test Tower.update() with its nasty if/else lines. Think about how important this aspect of your code is; a Tower’s ability to select the right Enemy that the user wants. I ran into this case when I started this project: my Tower Nearest strategy was returning the Enemy that was by-pixel closer to the actual tower, than by-distance closer to escaping. While testing my demo it drove me nuts! I told the Tower to attack the Enemy that was nearest to escaping, and here it was shooting 4 enemies behind the leader because that Enemy was nearer to the Tower. If you’ve read through comments on TD games on public sites like Kongregate or Armor Games, you’ve probably seen countless comments like “towers wont shoot at the correct enemies!”. This is a fairly common issue for devs to get wrong because we don’t realize how intensely important this is. Your player’s focus is 100% on that first Tower once they place it on the Map. That Tower is the only thing keeping them from losing the game, or getting an achievement or high score. They’re entirely invested in that Tower and since TD games are about “strategy”, your Tower properly doing exactly what is expected is paramount. First, thanks for posting this in-depth and very clearly explained tutorial series! It’s awesome to see such helpful contributions to the AS3 community. In the Tower.as class I noticed that you have both an _enemies:Array as well as _enemiesObj:Object. Is it so that the hasEnemiesInRange() method is more optimized than looping through the array to find the enemy? Absolutely right. I guess the argument could be made that I’m keeping track of twice the references to enemies, but when you know the specific enemy you’re looking for, you don’t have to loop through an array when you already know what you want. Thanks for clarifying the use of the object. It makes sense, but after reading your Jan 28, 2009 post on AS3 Dictionary Class vs. Array vs. Object!, I’m wondering why you decided to store the enemy reference in an Object instead of a Dictionary? Was it for code clarity? Is the performance gain of the Dictionary class over Object so minimal for a small data set that it’s better to just use an Object for clarity? Or does the new ASC 2.0 improve Object performance over the Dictionary class? You bring up several good questions! I haven’t tested Object/Dictionary access times since ASC2.0 has come out. There was an early version of the code where instead of giving bullets/towers/enemies references to other classes, I was trying to just pass around the class’ .uid property. I don’t remember why I switched to just passing around the actual objects, but you’re right. At that time I should’ve switched to a Dictionary instead of Object (using pre-ASC2.0 benchmarks). I actually just did a quick copy/paste job locally changing the _enemiesObj to _enemiesDict:Dictionary, instantiated it and changed all the _enemiesObj[e.uid] to _enemiesDict[e] and things work just fine.